The definition of Project Human Resource Management is making the most effective use of the people involved with a project. What is the key to manage people? Psychologists and management theorists have devoted much research and thought to the field of managing people at work. 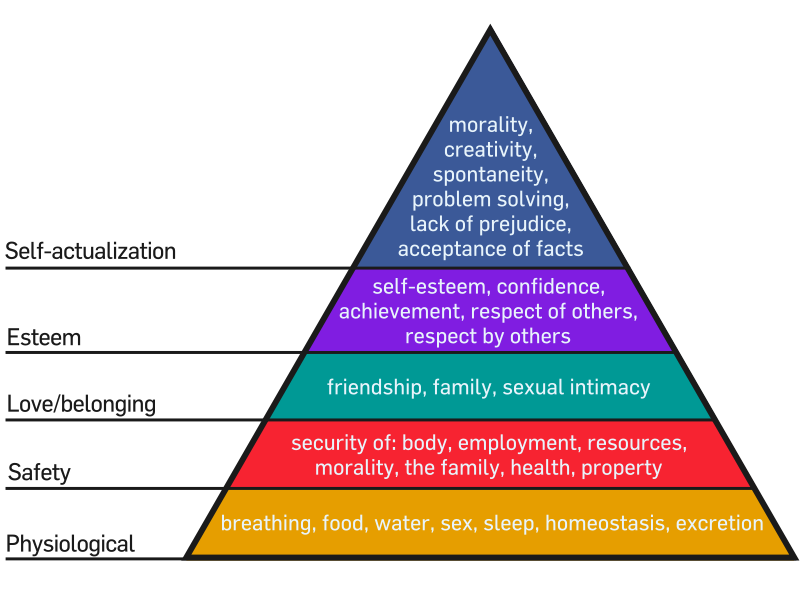 A Theory of Human Motivation, Maslow developed a hierarchy of needs which states that people’s behaviors are guided or motivated by a sequence of needs. These are biological needs. They consist of needs for oxygen, food, water, and a relatively constant body temperature. They are the strongest needs because if a person were deprived of all needs, the physiological ones would come first in the person’s search for satisfaction. When all physiological needs are satisfied and are no longer controlling thoughts and behaviors, the needs for security can become active. Adults have little awareness of their security needs except in times of emergency or periods of disorganization in the social structure (such as widespread rioting). Children often display the signs of insecurity and the need to be safe. When the needs for safety and for physiological well-being are satisfied, the next class of needs for love, affection and belongingness can emerge. Maslow states that people seek to overcome feelings of loneliness and alienation. This involves both giving and receiving love, affection and the sense of belonging. When the first three classes of needs are satisfied, the needs for esteem can become dominant. These involve needs for both self-esteem and for the esteem a person gets from others. Humans have a need for a stable, firmly based, high level of self-respect, and respect from others. When these needs are satisfied, the person feels self-confident and valuable as a person in the world. When these needs are frustrated, the person feels inferior, weak, helpless and worthless. When all of the foregoing needs are satisfied, then and only then are the needs for self-actualization activated. Maslow describes self-actualization as a person’s need to be and do that which the person was “born to do.” “A musician must make music, an artist must paint, and a poet must write.” These needs make themselves felt in signs of restlessness. The person feels on edge, tense, lacking something, in short, restless. If a person is hungry, unsafe, not loved or accepted, or lacking self-esteem, it is very easy to know what the person is restless about. It is not always clear what a person wants when there is a need for self-actualization. Thamhain and Wilemon’s theory is utilized by instructional designers to determine what type of power and influence is necessary to motivate project team members. Power is the potential ability to influence behavior to get people to do things they would not otherwise do.